Confession time, Internet. I’m not that big of a Spider-Man fan. I like him well enough, and I’ll be seeing Spider-Man: Homecoming on Saturday, but he doesn’t make my top 10 list of favorites superheroes—or even my top 20. That being said, I totally dig Spider-Girl. Who’s Spider-Girl, you ask? Well, that would be May “Mayday” Parker, teenage daughter of Peter Parker and Mary Jane Watson. She’s from an alternate future where Peter and MJ’s first child wasn’t stillborn and that whole Spider-Man selling his marriage to the devil thing never happened (Ugh, I hate that storyline so much). And she is amazing. The Spider-Girl series (plus The Amazing Spider-Girl and The Spectacular Spider-Girl) has a lot going for it. There’s the consistently good writing and art, for one thing. The supporting cast is a nice mix of old Spider-Man characters and new faces, and there are the great villains you’d expect from a Spider-Man rogues gallery. (Honorable crime boss and supervillain Black Tarantula is a standout—and also who I ship with Mayday. But then, I have a thing for hero/villain romances, which is probably obvious to anyone who reads my books.) But the best part of the series is Mayday herself: an incredibly likeable protagonist who, like her father, is often conflicted about being a superhero and makes great personal sacrifices to do the right thing. If you’re a Spider-Man fan, you’ll enjoy the familiar blend of high school drama and superheroics. If Spider-Man isn’t your thing, you might like that Mayday focuses more on avoiding pointless fighting and trying to reform her foes, and that she has a support network in her family that Peter never did. The Parker family dynamic is my favorite thing about the series. I love seeing happy, supportive families in superhero fiction (or any fiction, really). Peter and Mary Jane continue to be an awesome couple, and reading about a retired Spider-Man being an overprotective dad is just plain fun. I’m going to link to the first volume (which is super affordable at only a few bucks for a manga book-sized collection), but the nice thing about Spider-Girl is that it was a long-running series. So if you like it, there’s a ton of material to read. Plus, Spider-Girl is part of the bigger MC2 universe, so you’ll meet lots of other heroes like A-Next, the future Avengers team that came together when Loki (Who else?) attacked, and the X-People, a new version of the X-Men led by Jubilee. If you’re looking for more web-shooting and wall-crawling after watching the movie, you could do a lot worse than your friendly neighborhood Spider-Girl. 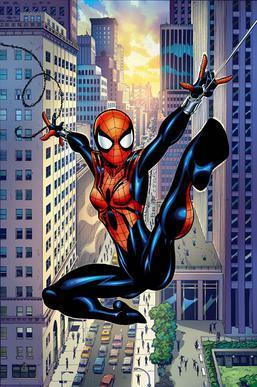 Do you have a favorite Spider-Girl storyline? Want to share your thoughts about Spider-Man: Homecoming? Let me know in the comments.